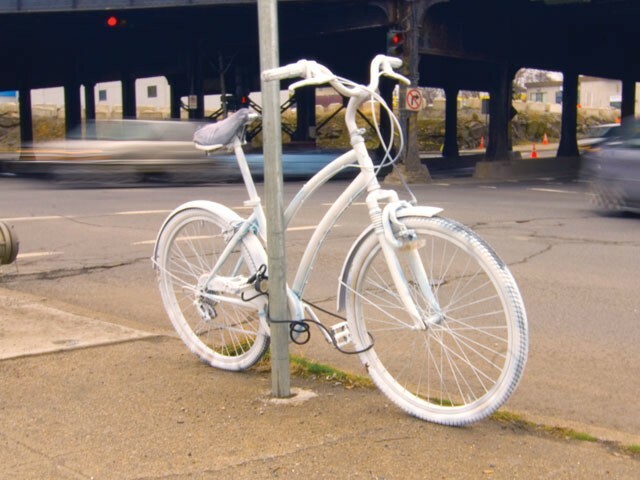 A stark reminder of last week’s bicycle fatality stands at the intersection of Division and Sprague in downtown Spokane — an abandoned bike painted completely white and locked to a street sign. The “ghost bike” is a memorial to David Squires, who was killed last week at the busy intersection when Scott Reckford hit him with a pickup, police say. Reckford, a bar owner, failed a sobriety test after the incident and was charged with vehicular homicide and a felony hit and run. Though Squires’ friends and family are still grieving, the memorial was erected and the crime addressed. But some are wondering if it’s enough. No such call to action has been issued yet after Squires’ death. “You would have a hard time finding somebody that would agree that the intersection is safe,” Snyder says of Sprague and Division. In fact, just three days after the fatal incident, a semi-truck going west on Sprague ran into the railroad viaduct, leaving the truck’s back end dangling above the ground. A recent post on Cycling Spokane asks if the intersection is “dangerous by design.” Comments and photos on the blog point out the proximity of turning lanes and crosswalks, as well as the faded street paint. The post’s conclusion: “The design [of the intersection] allows no margin for error and poor sight lines while encouraging speed” — factors that in all likelihood led to Squires’ death. Prosser says yes. It’s called a Complete Streets program. Though she’s not chair anymore, Prosser still sits on the city’s Pedestrian, Transportation and Traffic Committee. At its next meeting, the committee will likely vote on a Complete Streets resolution, sending it along to the city’s Community Assembly, which could then approve it and send it along to City Council, giving it a chance to become a citywide ordinance. It already has one vote at City Hall.